2013 orchestral arrangement for soprano, orchestra (2+1pc,2,2d1,2+1cb - 4,2,2,1 - timp, perc, hp, str)/. In the 1920's to 40's, Serbian-American scientist and inventor Nikola Tesla lived out his twilight years having metaphorically wrecked himself on Manhattan Island, bankrupted and broken by a public relations war with Thomas Edison. A staunch believer in the connection between his genius and sexual abstinence, Tesla shunned women, choosing instead to feed and care for street pigeons in his hotel room at the New Yorker. His closest friend was a white dove that visited him every day at his hotel room window. In moments of delirium, Tesla believed this pigeon to have mystical knowledge and the ability to communicate with him, and declared to friends that he was in love with her. One night, the bird flew into Tesla's room close to death, and according to Tesla, a light came from her eyes more intense than that of the most powerful lamps in his laboratory before she died in his arms. Tesla said that at that same moment, he knew his life's work was finished. 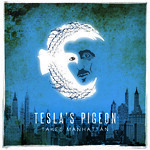 Tesla's Pigeon is sung from the dove's perspective in these final moments, and explores parallels between the relationship between Tesla and his pigeon, and Prospero and Ariel in Shakespeare's The Tempest, with text adapted from Ariel's songs, Goethe's Faust, the poetry of George Sylvester Viereck, Serbian traditional song and poetry, and personal letters to Tesla. Visit the official Tesla's Pigeon website.